ccasion. All the best to you! 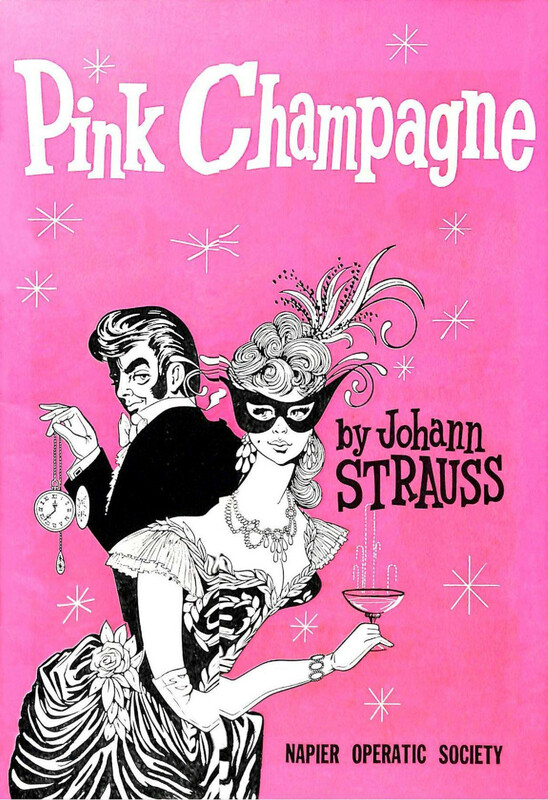 Tremendous drive, enthusiasm and down-right hard work are what Strauss required of any producer who attempts his “Pink Champagne”. But, add to this patience and a creative insight and your producer is – James Morgan. 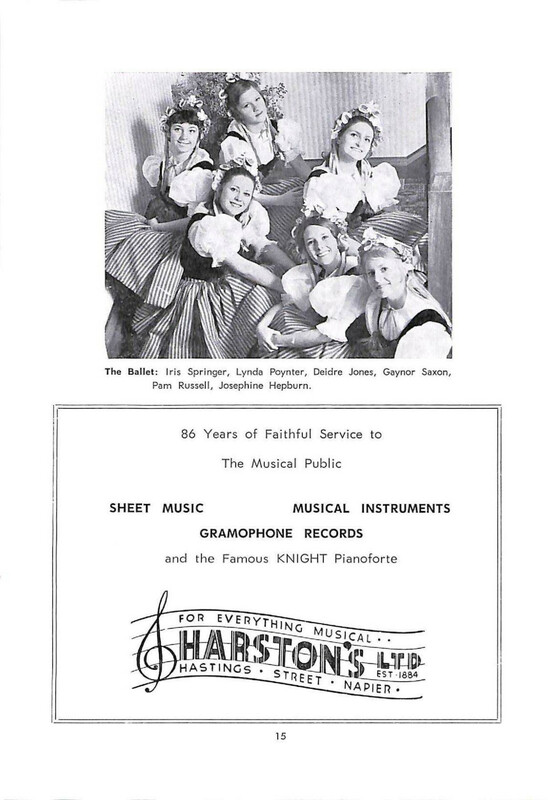 The confidence the Napier Operatic Society has in James was confirmed by his previous productions of “The Sound of Music” and “Camelot”. Every member of this society is aware of his concern that “Pink Champagne” be top-line entertainment and we are confident you will have many happy and joyous memories of this production. The society expresses its gratitude for all the long hours and untiring efforts James has given and we hope he will be able to produce for many years to come. 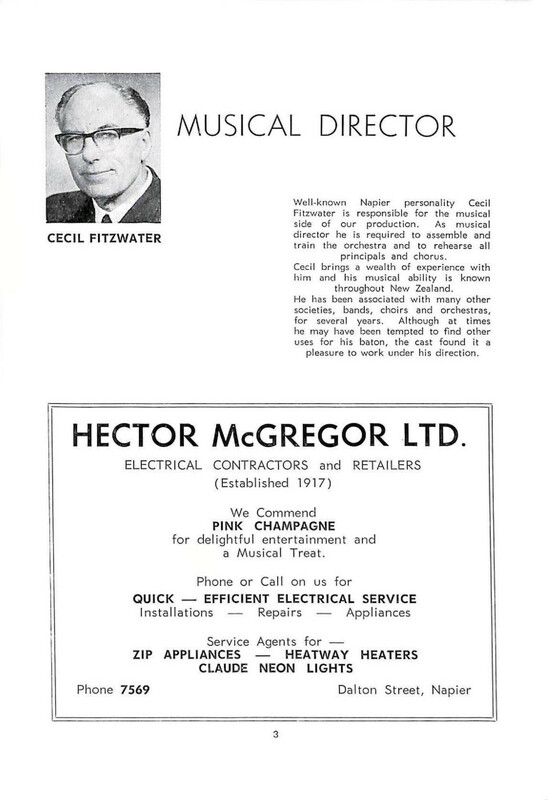 Well-known Napier personality Cecil Fitzwater is responsible for the musical side of our production. 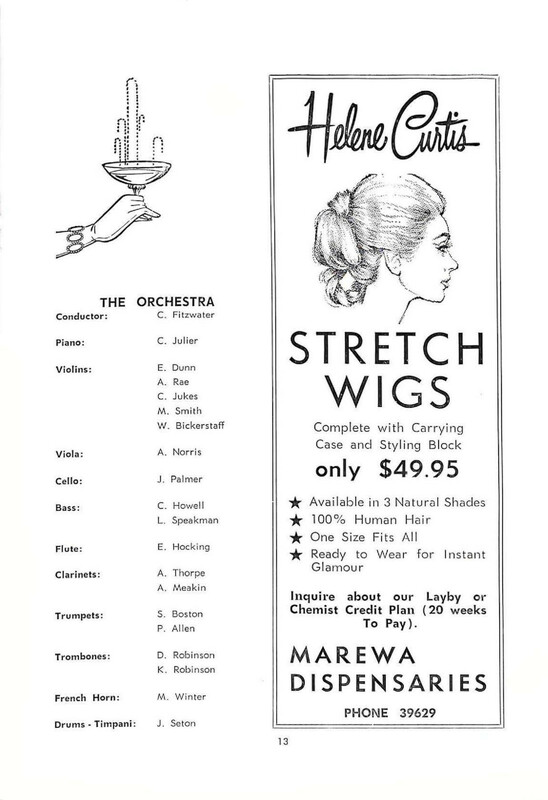 As musical director he is required to assemble and train the orchestra and to rehearse all principals and chorus. Cecil brings a wealth of experience with him and his musical ability is known throughout New Zealand. He has been associated with many other societies, bands, choirs and orchestras, for several years. Although at times he may have been tempted to find other uses for his baton, the cast found it a pleasure to work under his direction. for delightful entertainment and a Musical Treat. “Pink Champagne” offers Leigh Jones great opportunities to show her creative talents with the ballet. Strauss melodies are ideally suited for ballet, and we are sure you will be delighted with Leigh’s contribution to this production. The adapters, Eric Maschwitz and Bernard Grun, were deeply conscious of their responsibility in making any alterations to such a masterpiece as “Die Fledermaus”. Revision has been confined to making the action a little clearer and more consecutive. 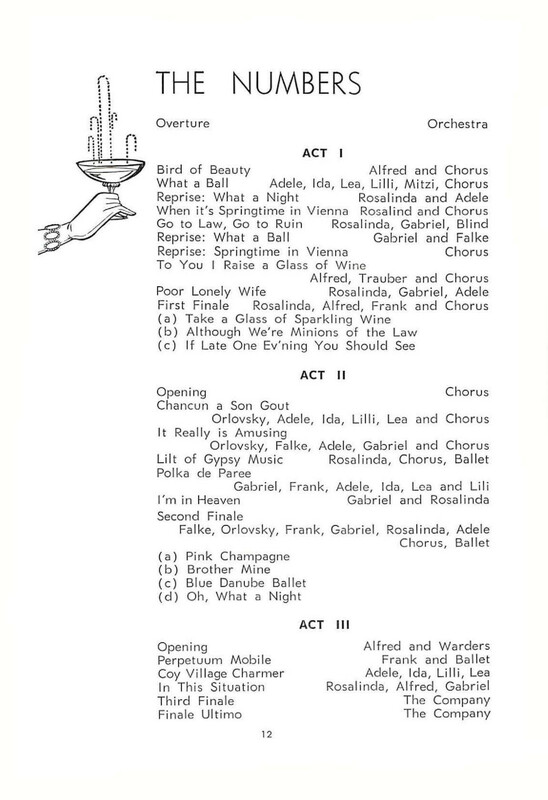 All the famous numbers have been retained and where feasible, chorus parts have been added since from the operatic societies’ point of view, one of the principal shortcomings of “Die Fledermaus” has always been the small amount of work provided for the ensemble. 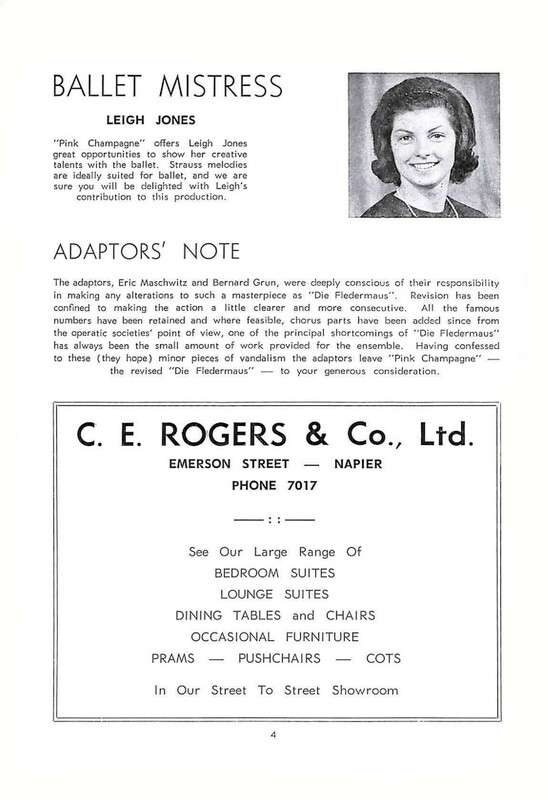 Having confessed to these (they hope) minor pieces of vandalism the adaptors leave “Pink Champagne” – the revised “Die Fledermaus” – to your generous consideration. The story is set in Vienna on a spring morning 1874, at the apartment of Rosalinda and Gabriel Eisenstein. Rosalinda has a new admirer, Alfred, a singer from the State Opera, who has just arrived to serenade her. Gabriel, the wayward husband, is thought to be abed. But no. This “ladies man” has been out all night with his best friend Dr Falke and still hasn’t arrived home! He’s forgotten that today is his 10th wedding anniversary and that his darling wife has remembered it – with a new smoking cap and jacket for him. Gabriel the gay blade, in a recent escapade after a fancy dress ball, tipped FaIke into a local fountain. FaIke dressed in the costume of a bat (Die Fledermaus) came out of the fountain very wet and very angry. The public of Vienna were amused, but not so the law. Gabriel was caught and tonight he’s off to jail for disturbing the peace. FaIke would never think of having revenge on Gabriel – or would he? Gabriel arrives home to his now not-so-adoring wife and later receives a call from FaIke who brings with him an invitation to the event of the year, Prince Orlovsky’s Pink Champagne Ball. Gabriel cannot attend – remember the prison sentence? “Why not go and enjoy yourself and report to the jail at midnight,” says FaIke. A grand idea – this party is not one to be missed! FaIke also has an invitation for Rosalinda which he gives after Gabriel has left. 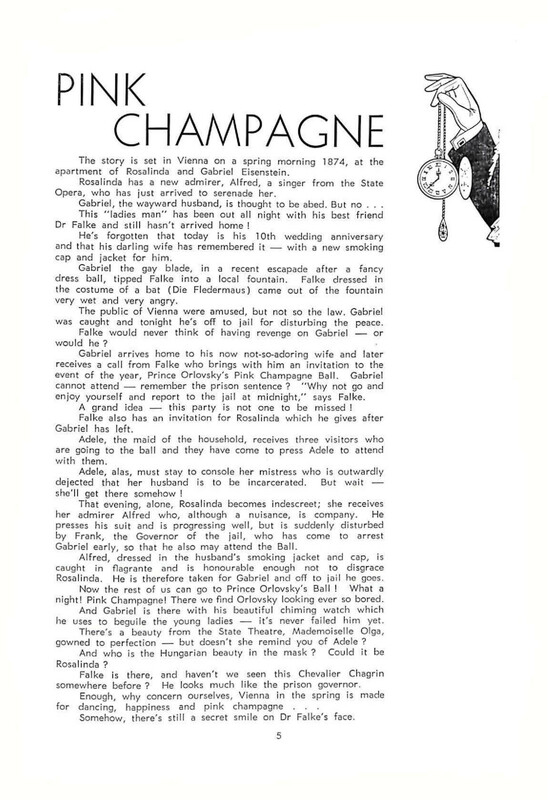 Adele, the maid of the household, receives three visitors who are going to the ball and they have come to press Adele to attend with them. Adele, alas, must stay to console her mistress who is outwardly dejected that her husband is to be incarcerated. But wait – she’ll get there somehow! That evening, alone, Rosalinda becomes indescreet [indiscreet]; she receives her admirer Alfred who, although a nuisance, is company. He presses his suit and is progressing well, but is suddenly disturbed by Frank, the Governor of the jail, who has come to arrest Gabriel early, so that he also may attend the Ball. Alfred, dressed in the husband’s smoking jacket and cap, is caught in flagrante and is honourable enough not to disgrace Rosalinda. He is therefore taken for Gabriel and off to jail he goes. Now the rest of us can go to Prince Orlovsky’s Ball! What a night! Pink Champagne! There we find Orlovsky looking ever so bored. And Gabriel is there with his beautiful chiming watch which he uses to beguile the young ladies – it’s never failed him yet. There’s a beauty from the State Theatre, Mademoiselle Olga, gowned to perfection – but doesn’t she remind you of Adele? And who is the Hungarian beauty in the mask? Could it be Rosalinda? FaIke is there, and haven’t we seen this Chevalier Chagrin somewhere before? He looks much like the prison governor. Somehow, there’s still a secret smile on Dr Falke’s face. Behind this show June Kauter has been busy with her band of dressmakers, all costumes on stage are the product of their wonderful effort. As wardrobe mistress June has designed and assembled yards and yards of colourful materials,measured and re-measured each and everyone in the cast, altered suits, hats, costumes, capes, uniforms and what-have-you. Being wardrobe mistress for such a show is a tremendous task. Our thanks to June and her helpers. Lighting plays as important part in the production of any show. 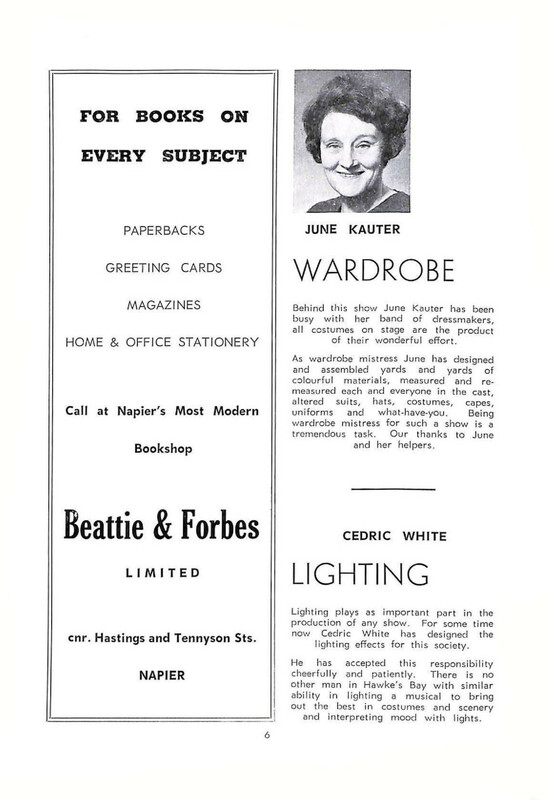 For some time now Cedric White has designed the lighting effects for this society. He has accepted this responsibility cheerfully and patiently. There is no other man in Hawke’s Bay with similar ability in lighting a musical to bring out the best in costumes and scenery and interpreting mood with lights. 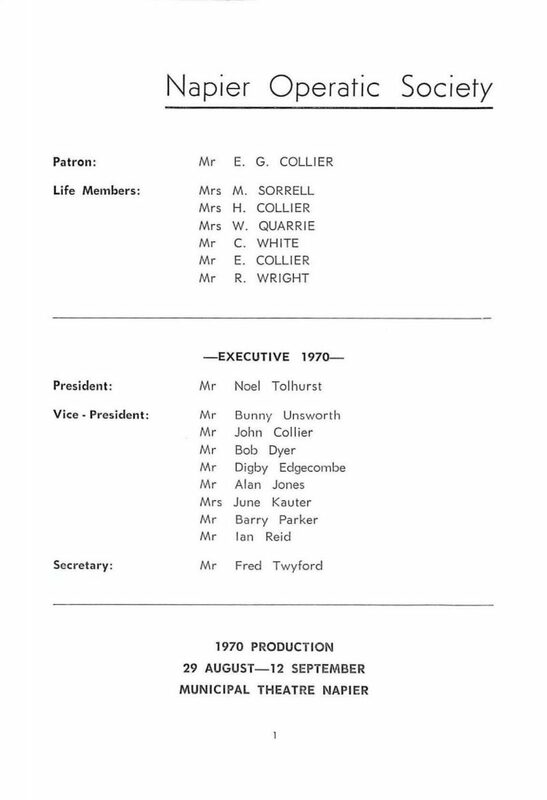 Luckily for the society it has as its anchor for scene design, construction supervision and stage management, John Collier. 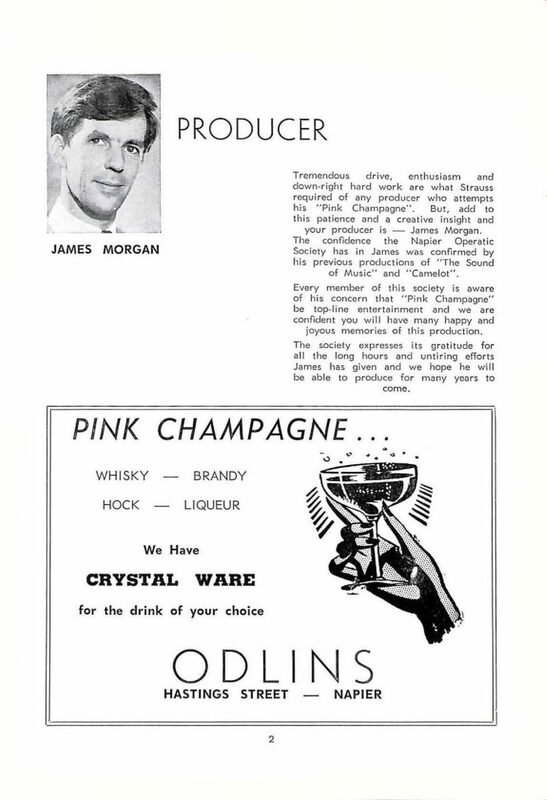 John modelled and supervised the building of all scenery in “Pink Champagne”. This has been no small task and with at least 20 skilled assistants many long and hard hours of work have produced what you see on stage. As with “Camelot” John and his construction team have established an unequalled standard. The construction crew is the backbone of this society and under John’s leadership they are creating a solid foundation for the society’s future. 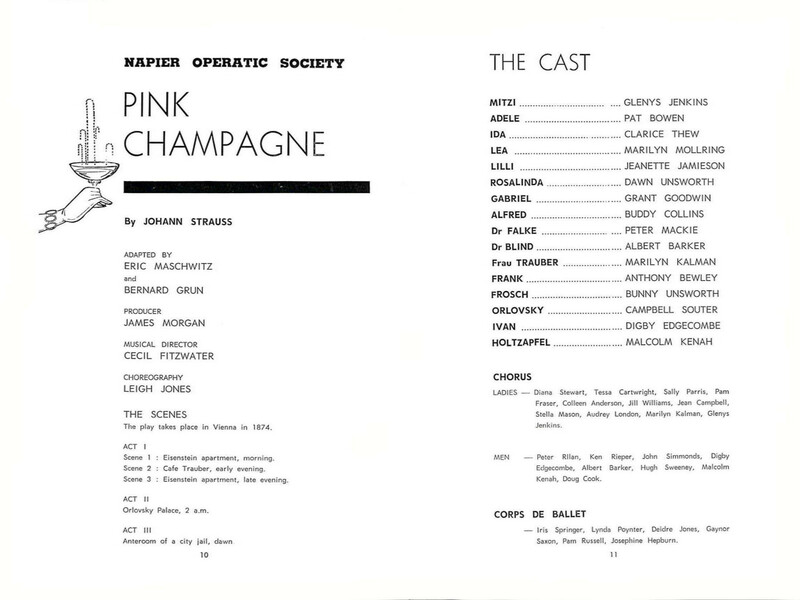 Almost 11 years ago to the day Dawn played “Rosalinda’ ‘in the Auckland Light Opera Company’s production of “Pink Champagne”. She has taken leading parts in musicals in either Napier, Hastings, Hamilton or Auckland every year since that time. She has sung as soloist with choral societies and orchestras and most recently she was soprano soloist in the “Creation”. In her spare time she also teaches singing. Her other loves are floral art and, of course, her family. Wellington-born Grant is a newcomer to this society, but not to stage work. A pupil of the late Silvio Truda he gained first stage experience with Karori Dramatic Society. A pleasant vocalist. Grant is coming into demand as a singer at public engagements. 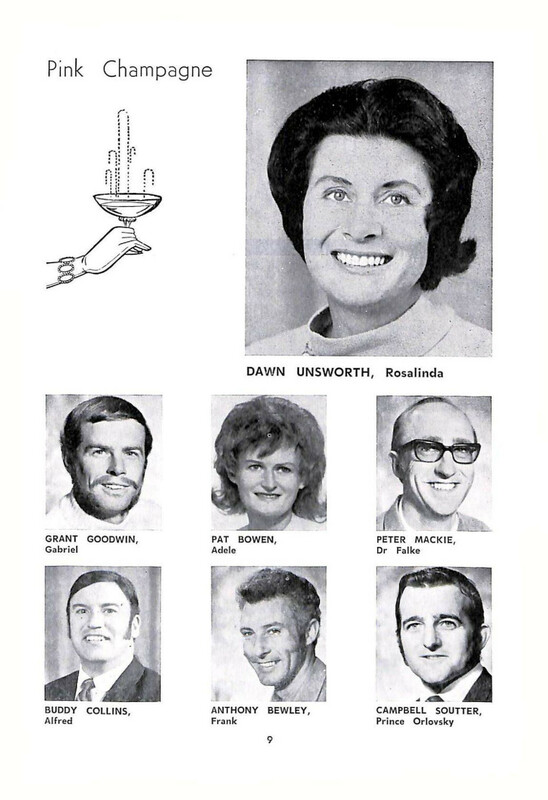 Pat also comes to us from Wellington, where she learnt singing as a pupil of the late Lazio Rogatsy. She has taken leads in “Pirates of Penzance”, “Tom Jones”, “The Boyfriend” and “The Maid of the Mountains”. Her lyrical soprano voice will, we hope, be heard more often in musicals for this society. For his role of Lancelot in “Camelot”, Buddy was accorded well-earned acclaim. We feel he will add further lustre to his already proven stage ability by his performance as Alfred, a part that is most demanding. A King in “Amahl” was Anthony’s first performance for this society. He has a fine, controlled, singing voice and we welcome him back to the society in the role of Frank. 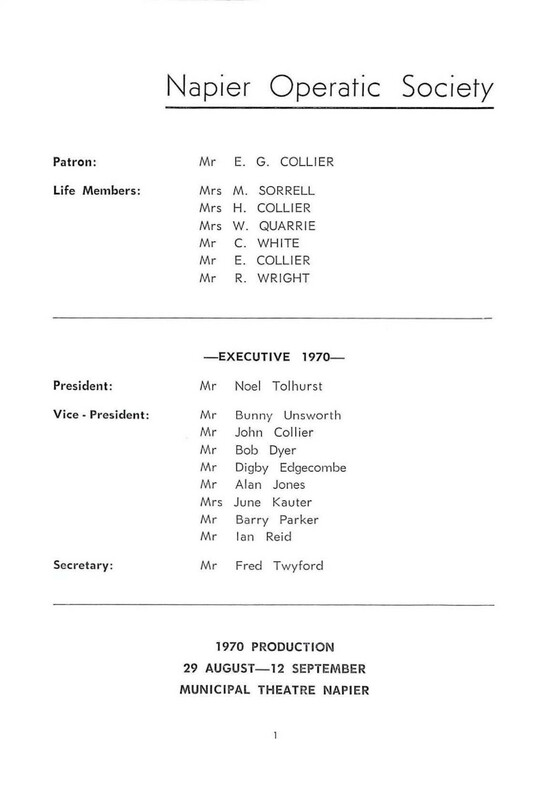 Peter is vice-president of the Hastings Group Theatre. He played Merlyn for this society in “Camelot” last year. He is one of the solid core of actors in Hawke’s Bay who is in demand by a number of societies. 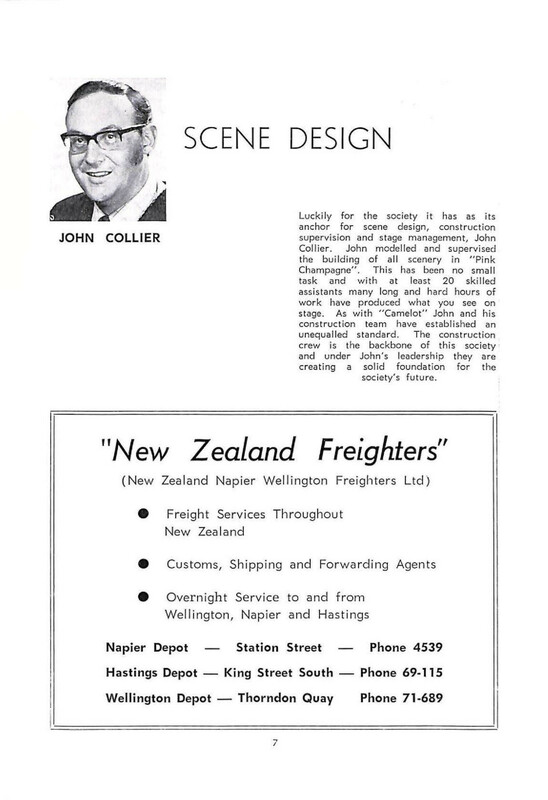 Campbell was born in Napier, but moved to Auckland at an early age. Since returning he has been part-time choir master for the Baptist Church. Campbell plays it tough by laying concrete in his spare time. The play takes place in Vienna in 1874. Scene 1: Eisenstein apartment, morning. Scene 2: Cafe Trauber, early evening. 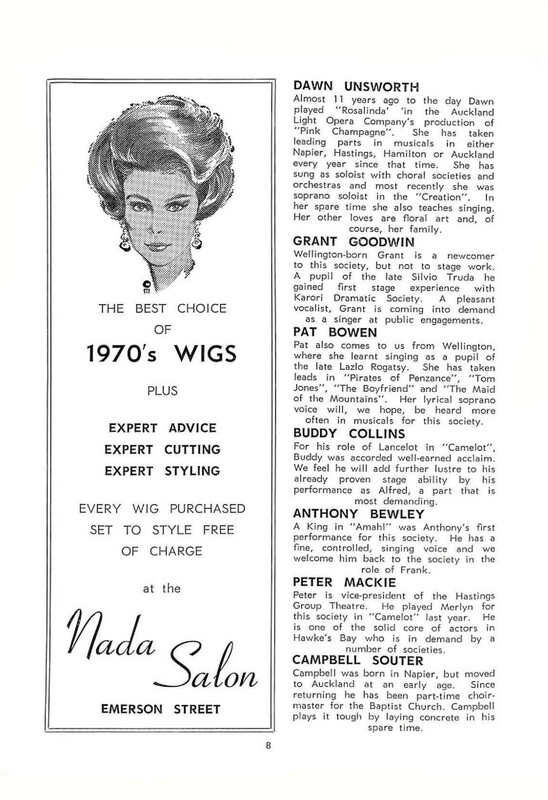 LADIES – Diana Stewart, Tessa Cartwright, Sally Parris, Pam Fraser, Colleen Anderson, Jill Williams, Jean Campbell, Stella Mason, Audrey London, Marilyn Kalman, Glenys Jenkins. MEN – Peter Ryan [? 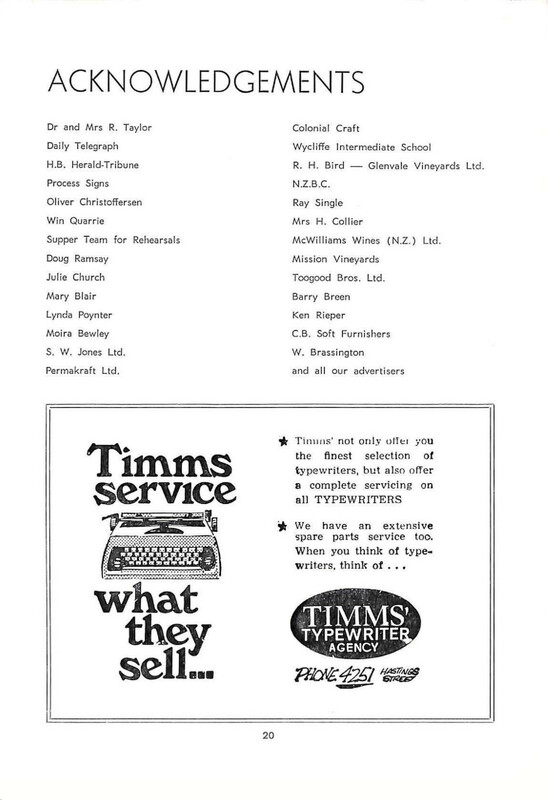 ], Ken Rieper, John Simmonds, Digby Edgecombe, Albert Barker, Hugh Sweeney, Malcolm Kenah, Doug Cook. – Iris Springer, Lynda Poynter, Deidre Jones, Gaynor Saxon, Pam Russell, Josephine Hepburn. Inquire about our Layby or Chemist Credit Plan (20 weeks To Pay). 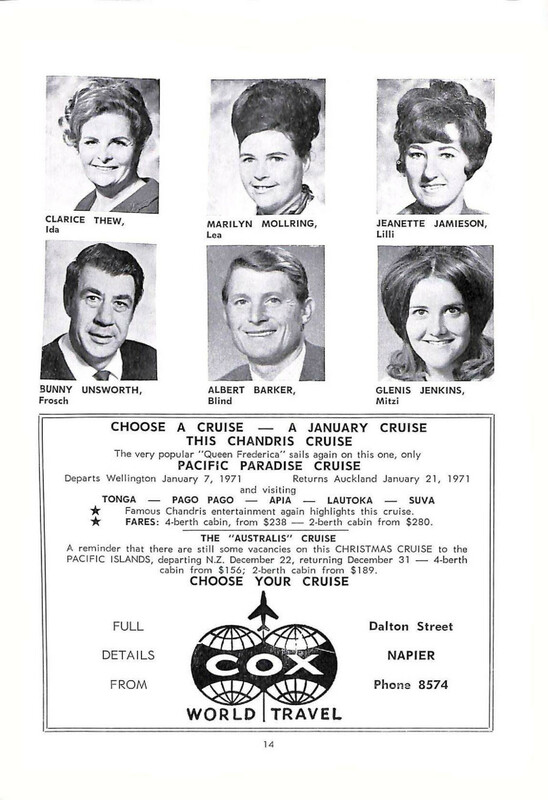 Famous Chandris entertainment again highlights this cruise. FARES: 4-berth cabin, from $238 – 2-berth cabin from $280. returning December 31 – 4-berth cabin from $156; 2-berth cabin from $189. 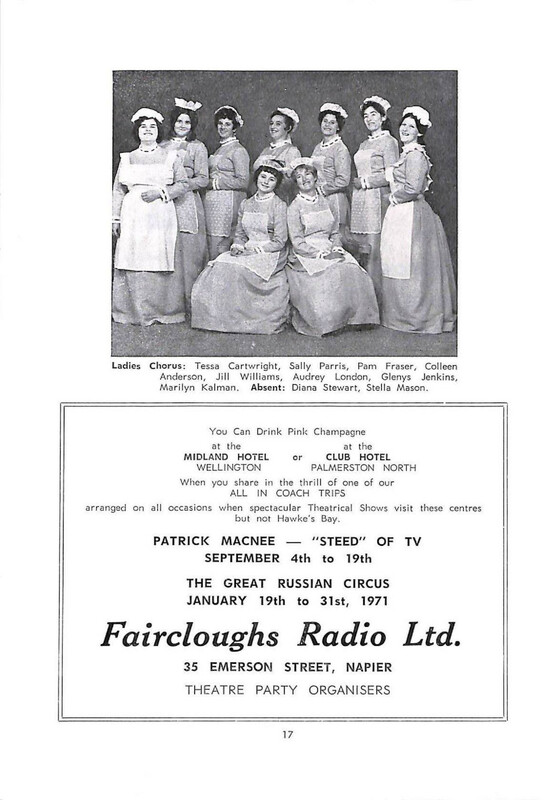 The Ballet: Iris Springer, Lynda Poynter, Deidre Jones, Gaynor Saxon, Pam Russell, Josephine Hepburn. 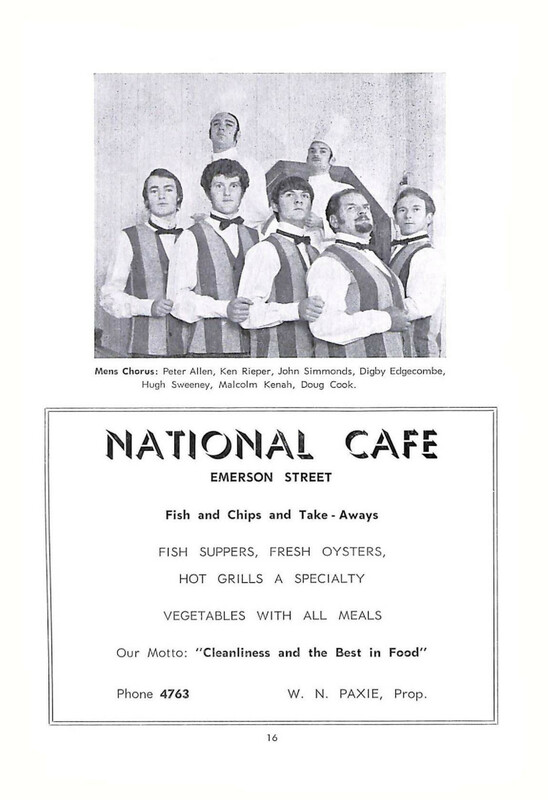 Mens Chorus: Peter Allen, Ken Rieper, John Simmonds, Digby Edgecombe, Hugh Sweeney, Malcolm Kenah, Doug Cook. Phone 4763 W.N. PAXIE, Prop. Ladies Chorus: Tessa Cartwright, Sally Parris, Pam Fraser, Colleen Anderson, Jill Williams, Audrey London, Glenys Jenkins, Marilyn Kalman. 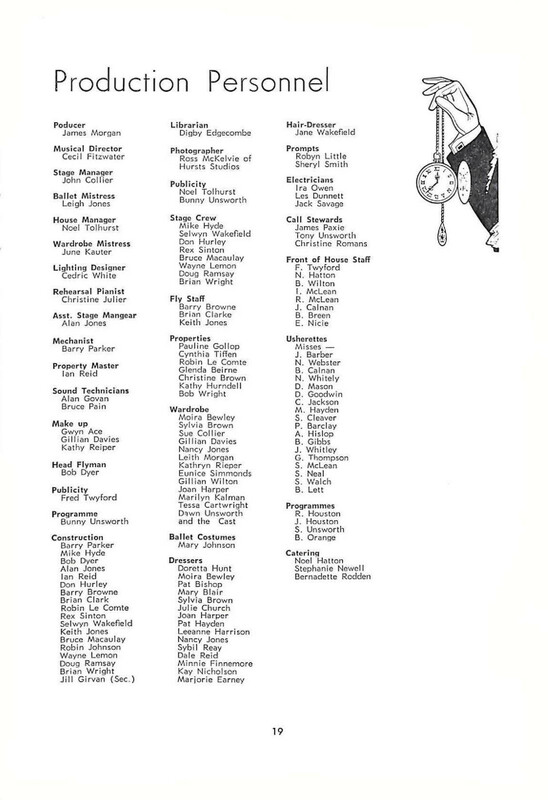 Absent: Diana Stewart, Stella Mason. S.W. 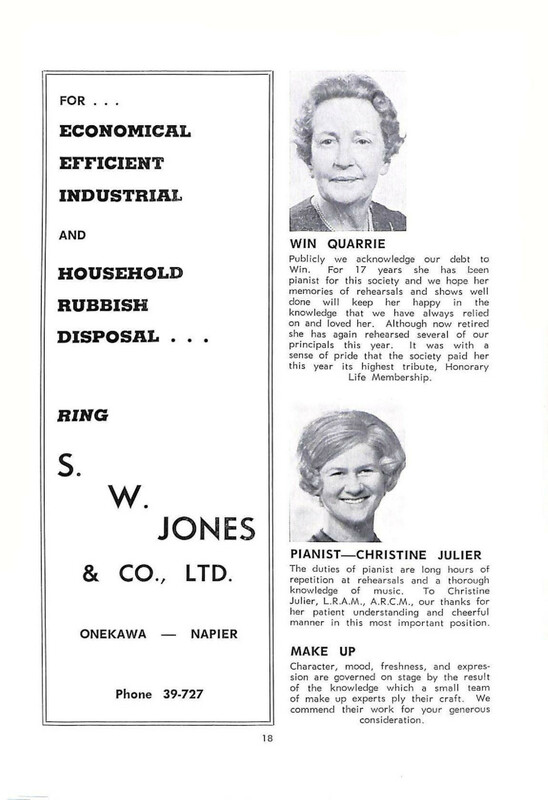 JONES & CO LTD. Publicly we acknowledge our debt to Win. For 17 years she has been pianist for this society and we hope her memories of rehearsals and shows well done will keep her happy in the knowledge that we have always relied on and loved her. Although now retired she has again rehearsed several of our principals this year. It was with a sense of pride that the society paid her this year its highest tribute, Honorary Life Membership. The duties of pianist are long hours of repetition at rehearsals and a thorough knowledge of music.To Christine Julier, L.R.A.M., A.R.C.M., our thanks for her patient understanding and cheerful manner in this most important position. Character, mood, freshness, and expression are governed on stage by the result of the knowledge which a small team of make up experts ply their craft. We commend their work for your generous consideration. R.H. Bird – Glenvale Vineyards Ltd.
We have an extensive spare parts service too. 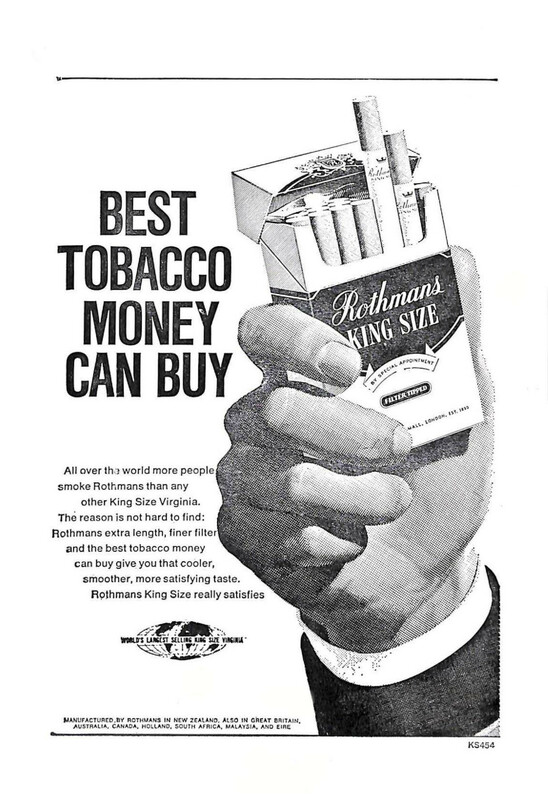 All over the world more people smoke Rothmans than any other King Size Virginia. 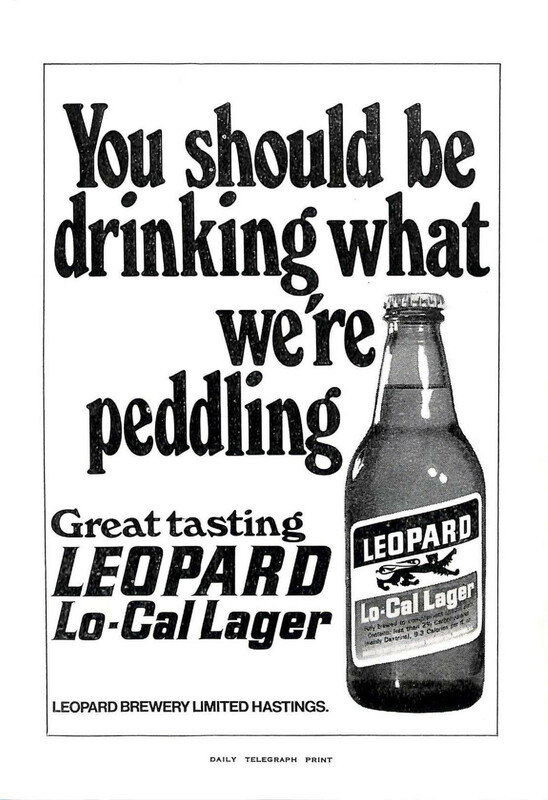 can buy give you that cooler, smoother, more satisfying taste. Zealand winemaking industry has truly come of age, why not complete your picture of a genuine New Zealand celebration by toasting the season with a fine New Zealand wine. 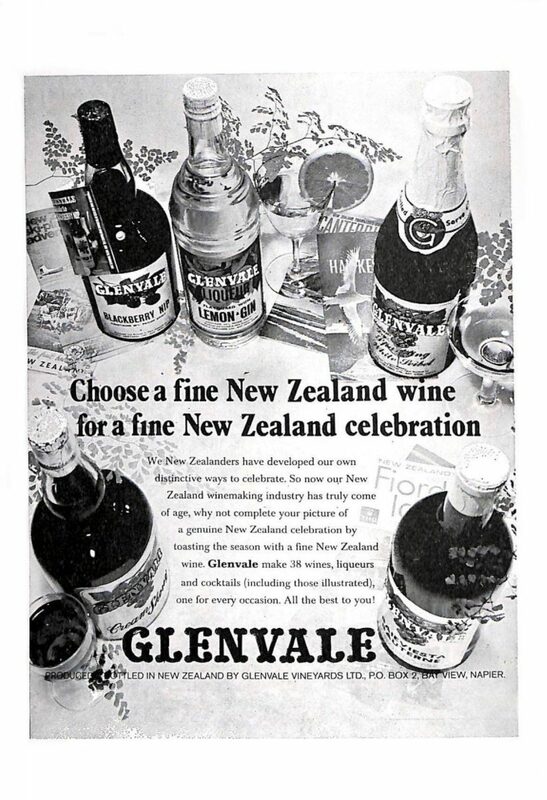 Glenvale make 38 wines, liqueurs and cocktails (including those illustrated), one for every occasion. All the best to you! pleasure to work under his direction. in making any alterations to such a masterpiece as “Die Fledermaus”. the revised “Die Fledermaus” – to your generous consideration. Gabriel arrives home to his now not-so-adoring wife and later receives a call from FaIke who brings with him an invitation to the event of the year, Prince Orlovsky’s Pink Champagne Ball. Gabriel cannot attend – remember the prison sentence? “Why not go and enjoy yourself and report to the jail at midnight,” says FaIke. A grand idea – this party is not one to be missed! Alfred, dressed in the husband’s smoking jacket and cap, is caught in flagrante and is honourable enough not to disgrace Rosalinda. He is therefore taken for Gabriel and off to jail he goes. Now the rest of us can go to Prince Orlovsky’s Ball! What a night! Pink Champagne! There we find Orlovsky looking ever so bored. And Gabriel is there with his beautiful chiming watch which he uses to beguile the young ladies – it’s never failed him yet. There’s a beauty from the State Theatre, Mademoiselle Olga, gowned to perfection – but doesn’t she remind you of Adele? And who is the Hungarian beauty in the mask? Could it be Rosalinda? FaIke is there, and haven’t we seen this Chevalier Chagrin somewhere before? As wardrobe mistress June has designed and assembled yards and yards of colourful materials,measured and re-measured each and everyone in the cast, altered suits, hats, costumes, capes, uniforms and what-have-you. Being wardrobe mistress for such a show is a tremendous task. Our thanks to June and her helpers. and under John’s leadership they are creating a solid foundation for the society’s future. Iris Springer, Lynda Poynter, Deidre Jones, Gaynor Saxon, Pam Russell, Josephine Hepburn,. PACIFIC ISLANDS, departing N.Z. December 22, returning December 31 – 4-berth cabin from $156; 2-berth cabin from $189. principals this year. It was with a sense of pride that the society paid her this year its highest tribute, Honorary Life Membership. The duties of pianist are long hours of repetition at rehearsals and a thorough knowledge of music. manner in this most important position.